The most creative and unique alternative to boring chocolates and soon-wilted roses, these Geeky birds will speak volumes about your creativity, love, and great sense of humor. When it comes to whimsical, romantic, silly, geeky and unusual Valentine�s Gifts, this GeekyBeek Pucker-Up love birds collection is the ultimate in Valentine's Day Gifts! We�ll include your personal message with your geeky Valentine�s Day love gift. Don�t worry, it can be sent anonymously. We�ll never tell who sent it. Geeky love birds are unique, creative, hand-painted Valentine�s gifts for your most romantic lover, or the geek girl or boy you and equally cool for co-workers, kids, teachers, family and friends. There�s a whole flock to choose from! Geeky Beek Pucker Ups. No water, no calories, no cavities! Geekybeek Pucker Ups are the most thoughtful, romantic, funny, geeky, original Valentine�s Day gift ever. Each Geeky Beek and Baby Beek in the flock has a cast-resin head with its own unique face - hand-sculpted by artist Tim Twinkler. 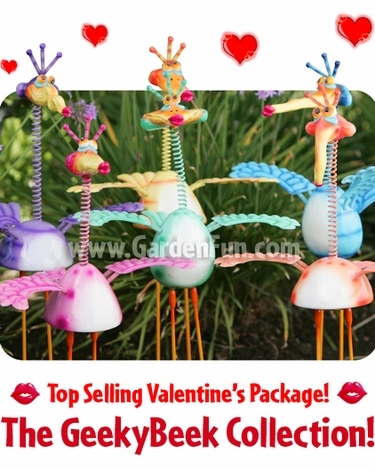 These adorable love birds are guaranteed to deliver an overwhelming supply of laughter and love, and whimsical fun! 26" GeekyBeek Pucker-Ups, Cast-resin head, Metal wings, tail, springs and legs, Plastic body & feet. Patented "springed" wings move in the wind for added dimension and motion. Optional pair of 5 inch detachable metal rods can be used to stake feet into ground. Bursting with fun personality, hand-painted with UV paint in meticulous detail. A special lacquer coating protects colors and keeps glossy shine on all Baby Beeks! Each bird comes with a gift hang tag that can be personalized. GeekyBeeks are our most popular signature item! View all GeekyBeek Pucker-Up Packages!